Hope you're all doing ab fab! I'm almost recovered from my cold which is amazing, usually they last about 2848140 months, but no only 3 weeks this time! HURRRRAY. Anyway, i'm back with a COSY af outfit - minus the shoes, not so comfy but hey ho, how cute do these kitten heels look with this outfit? Sorry winter black boots, i'm just not feeling you no more. 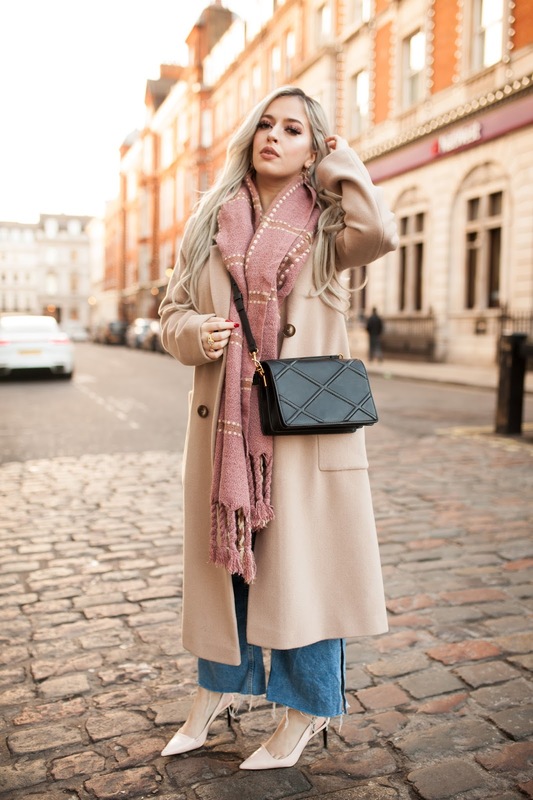 Okay, so i'm writing this post becauseeeee i've collab'd with an INSANELY AMAZING brand called Pom Boutique i discovered this brand through a uni friends mother that works for them, and i was a bit ify that maybe i wouldn't like the brand - but honestly look at that scarf! It's so so soooo me! They also do the prettiest jewellery, it's utterly gorgeous! They do a lot of rose gold and silver jewellery which is perfect! I didn't realise how well silver goes with rose gold until I looked at their website! That winter scarf is too warm, I'm loving it...and you got really pretty nails! Woow! The red polish even makes them look better. Loving this whole look, especially the shoes!! And I’m obsessed with chunky scarfs this year! Maybe it’s colder? !